The tech news world never sleeps, as evidenced by our updates on a new GoPro camera, a new edition of No Man's Sky, a new version of iOS... and maybe new phones from Huawei and Lenovo. Here are today's tastiest headlines, courtesy of our friends over at TechRadar. If you're looking to get in on the GoPro action camera... action, then we have just the compact device for you: the new "go-anywhere, capture-anything" camera can be yours for a mere £199.99, which is some way south of the £399.99 price that the top-end Hero 6 Black commands. 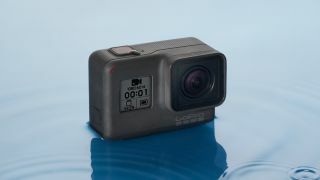 Of course the new model isn't as powerful – you have to settle for 1440p video rather than 4K, for example – but it looks like a great value option in the GoPro line. No Man's Sky isn't for everyone – the vast, sprawling, space exploration game is going to be a little too slow and tedious for some tastes – but it's undoubtedly one of the most hyped video game releases of the past few years, and now it's making the jump from the PlayStation and PC to the Xbox One. The 4K-ready, Microsoft console-friendly version of the game is coming at some point this summer, with no exact release date revealed yet. Attention, iPhone (and iPad) owners: Apple has started rolling out the iOS 11.3 update, which means it should be appearing on your devices very soon. While the latest software doesn't include any major new features, there is now a battery health check option so you can see the current maximum capacity of your ageing battery. Oh, and there's improved augmented reality rendering, and (inevitably) some new Animoji faces to play around with. 4. For Huawei's next trick... a foldable phone? Huawei just unveiled some fantastic new flagship phones in the form of the P20 and the P20 Pro, but it's not stopping there. The latest whispers from the rumour mill suggest the Chinese outfit is about to join the foldable phone bandwagon that Samsung and Apple (supposedly) already have a seat on – a patent that's just emerged shows Huawei investigating the idea of a widescreen device you can fold in half like a digital book. And finally from the phone rumours department, the upcoming Moto G6 from Lenovo could be one of the best-looking handsets of 2018 if a newly leaked image is to be believed. It shows a slim, appealing handset design, with a dual-lens camera around the back, and a fingerprint sensor around the front on a short bezel. We should see it for real soon, with the official launch date expected to be sometime in the next couple of months.